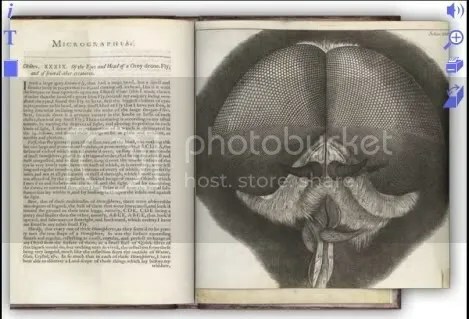 Look at Robert Hooke’s incredible, and conception-changing Micrographia (1664). And see it as if you are looking at the very book with excellent viewing software, at Turning the Pages Online (click “Turn The Pages”). This book must have struck one as if from another planet. See the overleafs open up into the most extraordinary illustrations of the smallest of things. It was the 3D, Surround Sound, epic film of its time. Published under the aegis of The Royal Society, the popularity of the book helped further the society’s image and mission of being “the” scientifically progressive organization of London. Micrographia also focused attention on the miniature world, capturing the public’s imagination in a radically new way. This impact is illustrated by Samuel Pepys’ reaction upon completing the tome: “the most ingenious book that I ever read in my life. The book on microscopic observations is also in Huygens’ possession, but, unless I am mistaken, it is in English. 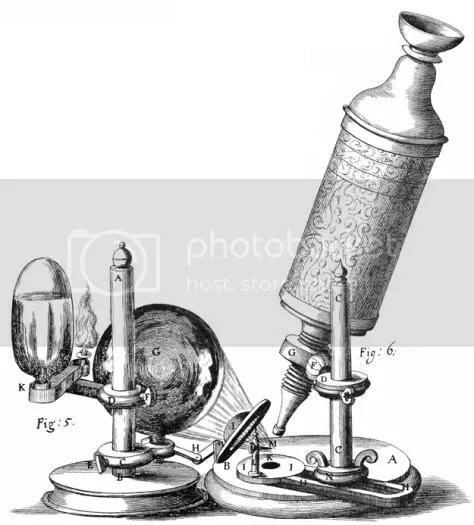 He has told me wonderful things about these microscopes, and also about certain telescopes in Italy (letter 26). Several prospective questions arise here. As mentioned, we are unsure if Spinoza has just met Huygens (Nadler brings up a counter argument beside the one that I suggest), so we cannot say if Spinoza was able to look at the book at the Huygens estate. At this point he seems only to have heard of it, but this may even be a polite deferment. If Spinoza did visit the estate and looked at its pages one certainly can imagine its impact upon the lens-grinder. He must have been mystified and pleased. There is a very good chance that its viewing set off a change in Spinoza’s thinking about his lenses, optics and the world, for by letter 32 in late November Spinoza is making metaphysical analogies that seem to appeal to microscopic observations, the “tiny worm living in blood”¹. This seems to suggest that somewhere in the summer of 1665 Spinoza became more focused on both the telescopic and the microscopic uses of lenses. Years later, after much experimentation, Huygens would finally admit that Spinoza was right that the smallest of lenses were best for microscopic viewing. Nadler suggests, via Klever, that Spinoza had a reputation for his telescopes and lenses as early as 1661, (“Borch’s Diary”, from A Life 182). Whether Spinoza in this summer decided to make new observations, or had already been making them, or if there were microscopes at Huygens’ estate, we cannot know. Whether Spinoza was working with microscopes or not, the presence of the Micrographia at the Huygens estate, the likelihood that Spinoza would have seen its breath-taking layout (not to mention the possibility that Hooke’s generous and detailed description of how he made his lenses by a thread of glass was relayed to him), combined with Huygens own experiments with lens designs, lens lathes, and spherical aberration at the time, the summer of 1665 must have had a concerted conceptual and imaginative impact on Spinoza’s thinking and practices. 1. There is scientific context for the imagine of worms in blood: The “dust” on old cheese was found to be not dust at all but little animals, and swarms of minute worms were discovered tumbling about in vinager (Fontana 1646, Borel 1656, Kircher 1646). Kircher announced that the blood of fever victims also teemed with worms, and there was talk that they infested sores and lurked in the pustules of smallpox and scabies. (Ruestow, 38).